The Managing Director of an innovative fresh produce company has won a 2017 Telstra Business Women’s Award. Western Australia’s Jennifer Franceschi, Managing Director of Fresh Produce Alliance, was awarded the 2017 Telstra Australian Corporate and Private Award for her work in turning food waste into value-added products. Ms Franceschi’s Fresh Produce Alliance produces ‘Born Pure’, a range of baby foods using produce that would have otherwise gone to waste. Fresh Produce Alliance also produces ‘Avo Vita’, which turns unwanted avocado into products like avocado chocolate mouse and ready-to-drink smoothies. 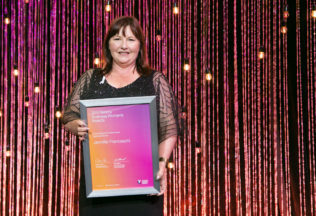 Joe Pollard, Telstra Business Women’s Awards Ambassador, said Ms Franceschi has a strong understanding of the generational challenges of farming in Australia. “She is using innovative technology to champion a sustainable agriculture,” Ms Pollard said. Ms Franceschi has worked in the avocado industry since her first summer job in 1974 where she began working at her family’s avocado orchard. The Fresh Produce Alliance was established in 2016. Kellogg’s is now selling a range of baked muesli breakfast biscuits.